They say not to judge a book by its cover, but we think the outside of an envelope is just as important as what’s inside. Nico and LaLa offers wedding invitation calligraphy by hand and machine, as well as custom and vintage stamps. Invitation stuffing and sealing services are also available, to ensure your custom invitations are pristine and ready to mail. 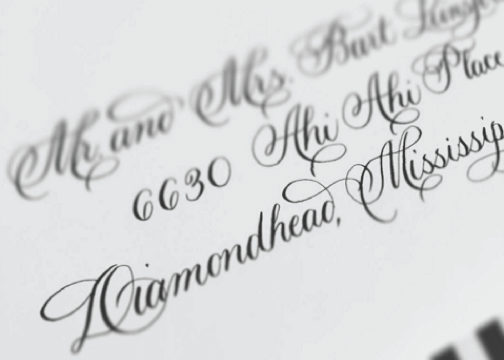 Hand Calligraphy is when a skilled calligrapher hand addresses your envelopes using pen and ink. 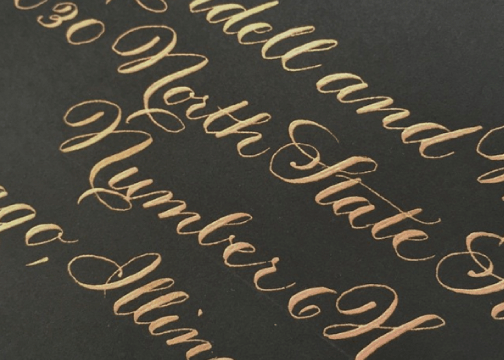 Nico and LaLa work with two fabulous calligraphers, who each have their own unique (and beautiful!) style. Please keep in mind that hand calligraphy must be booked in advance, and typically takes two weeks minimum. Pricing starts at $3.00 per envelope and a $50 handling fee applies to all hand calligraphy orders which includes shipping. 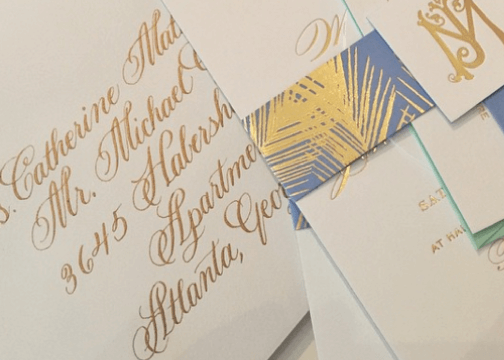 Machine calligraphy is a less expensive envelope addressing option that mimics hand calligraphy. Nico and LaLa offer a variety of options and can use a font that matches your invitations. Your designer will advise on fonts and ink color and will provide a proof for you to review before we begin addressing. Please note textured and/or thicker envelopes may not be eligible for machine calligraphy. Pricing starts at $1.25 per envelope. 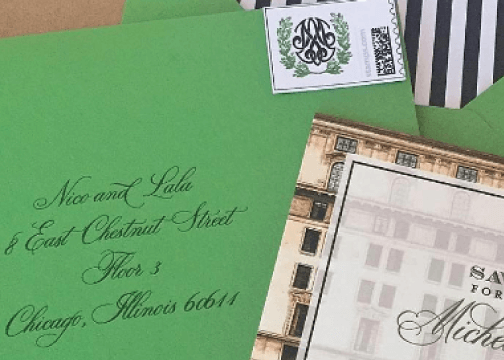 Nico and LaLa offer custom stamps to match your invitation suite. Designs will be included on your invitation proof if you indicated interest in custom stamps on your Invitation Form. Custom stamps are approximately double the face value of the postage. You will need postage on both your reply envelopes and outer envelopes. Reply postage is typically standard $0.50. To determine the postage of the outer envelope, you will need to have a full ensemble weighed at your local post office, as every post office weighs and measures envelopes differently. Nico and Lala can either provide you Jpeg(s) and you can order stamps from Photo Stamps (www.photostamps.com) or Zazzle (www.zazzle.com) or we can order them on your behalf for a $25 fee. If your ensemble features a belly band or is being assembled by N&L, we will adhere the reply stamps to the reply envelopes before assembly. If you are ordering your own stamps, the reply stamps will need to be shipped to our studio. If N&L is ordering custom stamps on your behalf, they will ship with your invitations. If you are ordering them yourself, please refer to the stamp vendor’s timeline as posted on their respective websites. We are happy to source Vintage Stamps for you. $100 Sourcing Fee applies. Keep in mind that most Vintage Stamps will require licking. 1. Square envelopes require extra postage. 2. We recommend finding a local post office that offers Hand Cancelling. Hand Cancelling is a service offered by some post offices where wedding invitations are run through meters by hand rather than machine, in order to maintain the beautiful calligraphy and outer envelope. 3. 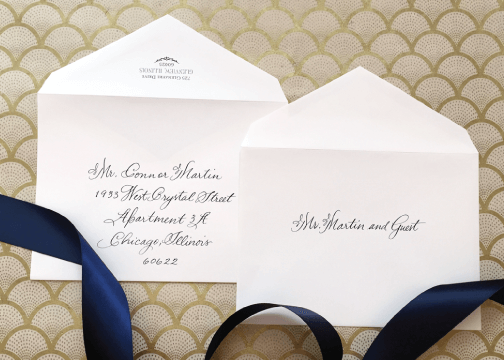 As a courtesy to your guests, Reply Envelopes should include a postage stamp. Nico and LaLa offers stuffing, sealing and stamping services. Pricing starts at $0.25 per service, per envelope. This is a great option for busy or traveling brides.